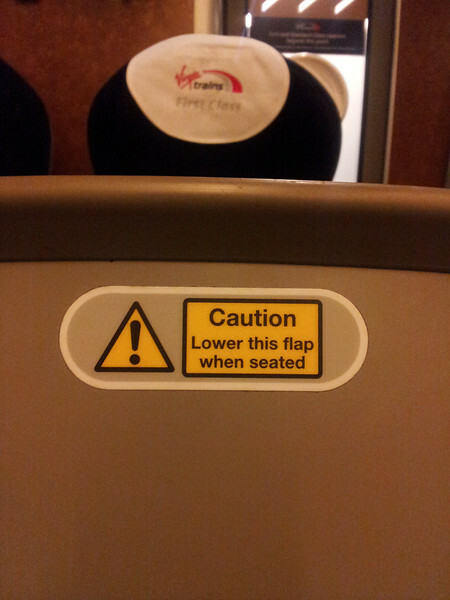 Hello, and once again welcome to the Railwaymedia blog. 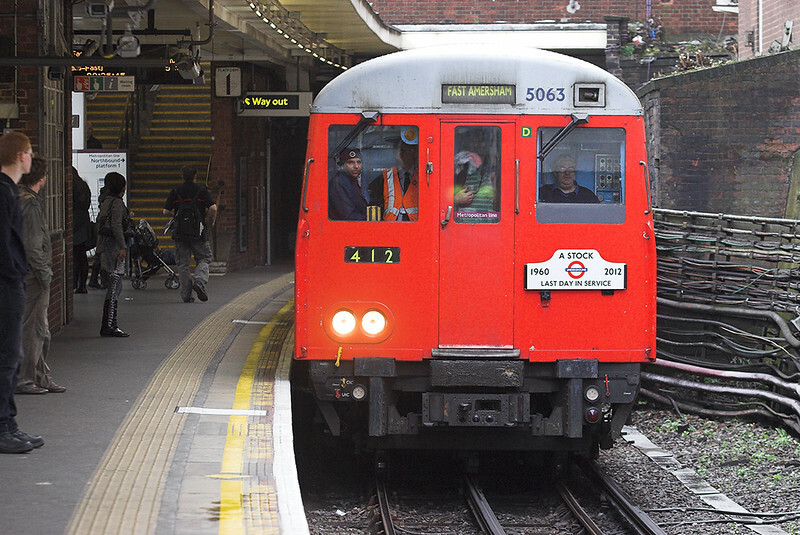 I know it has been less than a week since I published edition number 28, but with no plans to travel anywhere in the next week or so I thought I would take the opportunity to cover my visit to London to witness the last public runs in service of the Underground's veteran 50 year old A-Stock. 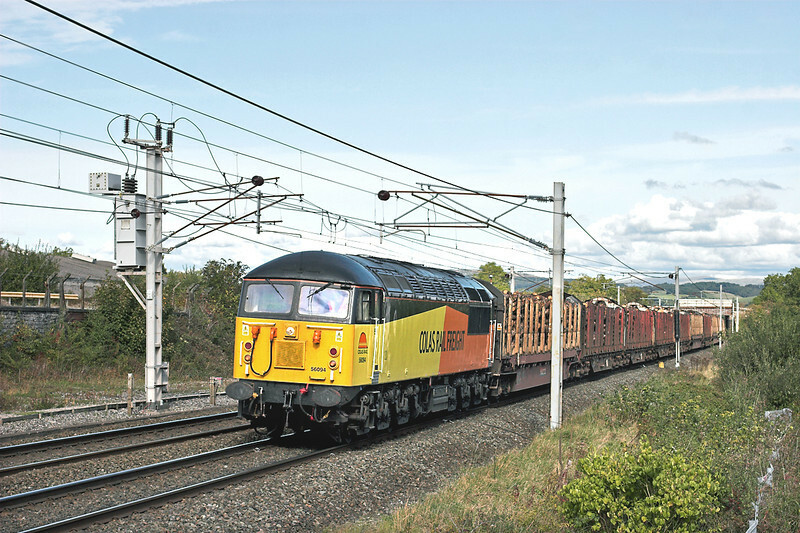 Before that though, the big excitement in the North West last weekend was the first use of a Colas class 56 on a Carlisle to Chirk Log Train. It had been rostered to work the Thursday loaded train from Teigngrace to Chirk and then Friday afternoon headed up to Carlisle. Following loading it then was in charge of Saturday afternoons 6J37, which at a weekend is booked via the West Coast Main Line rather than the weekday route via Settle. There is a nice new bar on Carnforth station, The Snug, which usually has 4 real ales available, so the decision was made to go there to see the 'Grid'. The location, to the north of the station, I had actually never used before for pictures, despite the many hours I used to spend at Carnforth with stand-by engines. Of course as is usual with my luck when out and about, despite it being sunny everywhere else it wasn't shining here! Hopefully the 56 will become a regular performer on this train, though it is at a slightly inconvenient time as normally when I've been on night turns all week I am in the pub when it is due through! 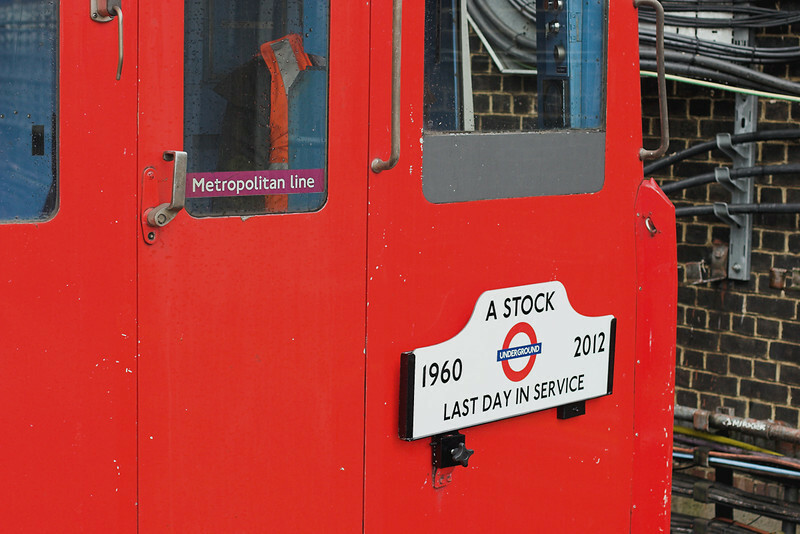 So Wednesday of this week was advertised as the final public run in service of a London Underground A60/A62 stock Metropolitan Line train. Built between 1960 and 1962 they are (or were) not only the oldest passenger coaches in service in Britain but, as far as I know, the last trains still in service built by the firm Cravens of Sheffield, which was bought out by Metropolitan-Cammell in 1966, and was once a prolific builder of rolling stock. The diagram (train 412) for the last day included several round trips between Amersham and Aldgate, also with visits to Watford. It was booked to work the 0928 fast train from Baker Street to Amersham, so in order to beat the off-peak 0930 curfew for Oyster Cards I boarded at Finchley Road for a run on it up to Rickmansworth. As far as I know this was the first time I have travelled on a Metropolitan Line train on the fast lines north of Harrow, and obviously it will be the last time I'll ever do it on one of these trains! At Northwood there was a 4 car rake of A-Stock in the siding which has been used for loading the withdrawn coaches onto lorries destined for the scrap yard. I decided to get a shot of '412' returning past here, though one of the new S8 trains heading north got in the way a bit. I heard later that the two nearest coaches in the siding, 5095 and 6095, were removed by road 2 hours later. I had a ride up to Watford as I have also never previously travelled over this branch. 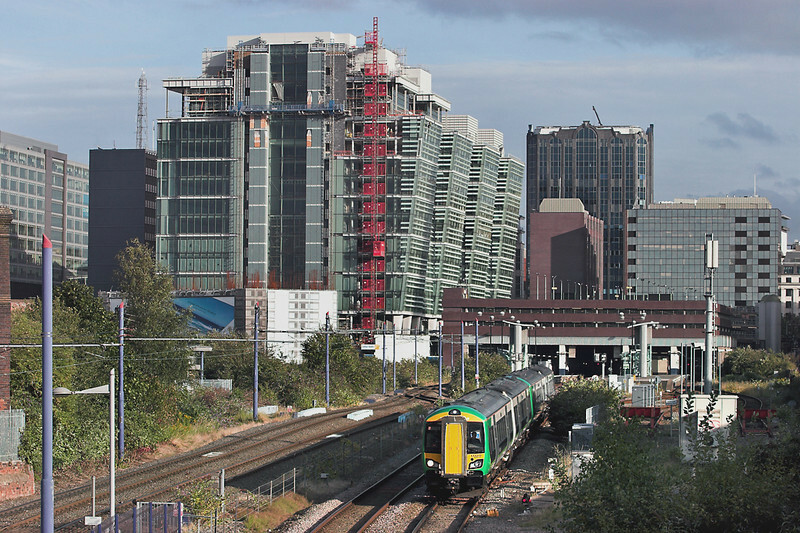 There are plans to divert this line from the present terminus on the edge of Watford via a short new section of line to take over the former BR route from Croxley to Watford Junction. 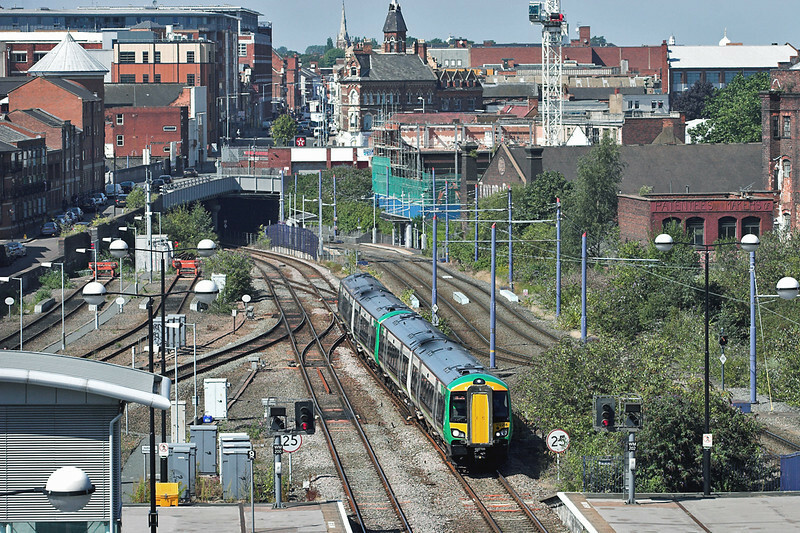 The residents of the leafy suburbs surrounding the present station are kicking up a fuss about the loss of their direct trains to Central London, but there can be no doubt that having the Metropolitan link directly to the Town Centre and West Coast Main Line at the Junction can only be a good thing for the vast majority of users. Back to chasing train 412, and having missed the next northbound train whilst I had my dinner in Watford, I went to Pinner. I almost got 'bowled' by an S8-Stock heading the other way, meaning a rather quick change of lens. Hanging round with my camera waiting for it, full marks to the two Community Service Officers who, rather than the expected "Excuse me sir, what are you doing?" just nodded and asked "When is it due?" I suppose they were of course aware of all the enthusiasts about, but it would be nice if that was the normal casual approach from people in authority to anyone wielding a SLR camera on a suburban station. I wasn't expecting too much from the weather during the day, the forecast had been for showers, but come early afternoon it started brightening up. I met up with Richard Stiles who showed me two good bridges located between Willesden Green and Kilburn stations. There followed about an hour of photography whilst we waited for the A-Stock to return which, with about 30 trains an hour each way between the 6 tracks of the Jubilee, Metropolitan and National Rail's Marylebone lines, resulted in quite a few picutres.Wonder of wonders also, the sun appeared for the return of train 412! 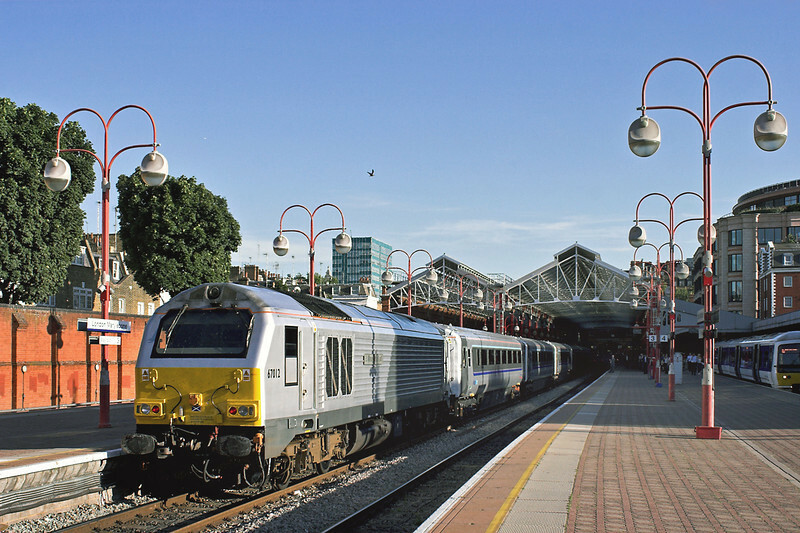 It was basically a case of waiting for the train then to return from Amersham, so we got a few pictures at Harrow before doubling back to Preston Road for a final shot and, more importantly, to board it for its last run through to Aldgate. 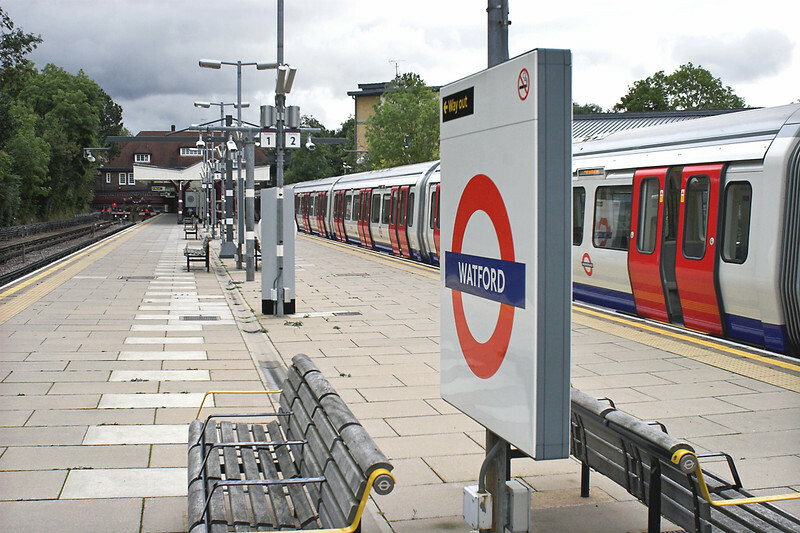 It formed the 1808 from there to Watford which, as it is peak hour, would normally be full of commuters. This day however I suspect quite a few failed to board it as it was full, literally, with Enthusiasts before it even started its journey. Never before I would imagine since the opening of the line has a train terminated at Aldgate and virtually every single passenger has remained on board to travel back! I needed to catch the 1930 Pendolino back from Euston as I was working that night, so I travelled with the a-Stock as far as Finchley Road. Richard stayed on to Watford and for its final journey as the 1917 back to Harrow-on-the-Hill. 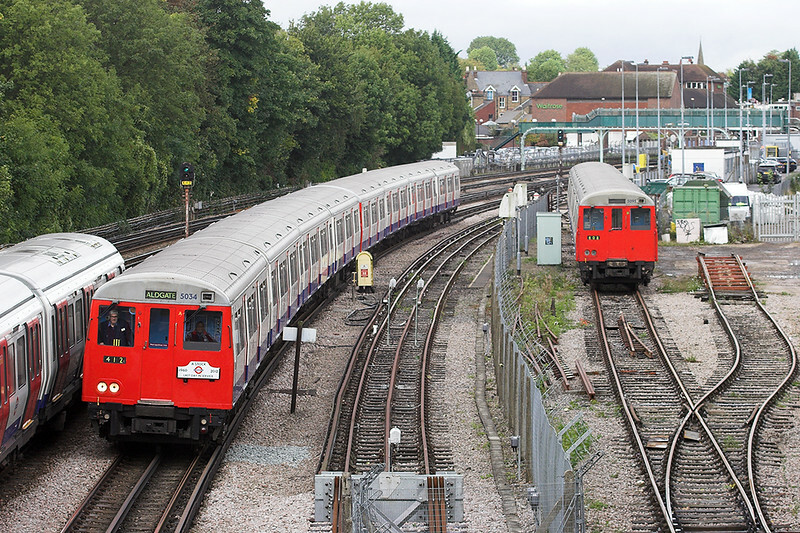 There is a farewell tour planned for this Saturday, the 29th, when for £40 you can travel over every bit of the Metropolitan Line. 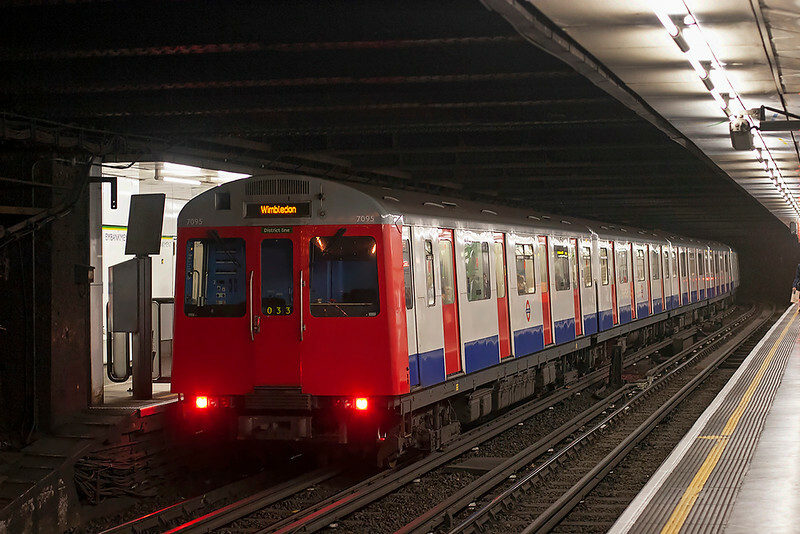 In many ways the withdrawal of these trains mark the end of an era as they are the last trains on the London Underground with many features such as luggage racks and 'traditional' transverse seating. 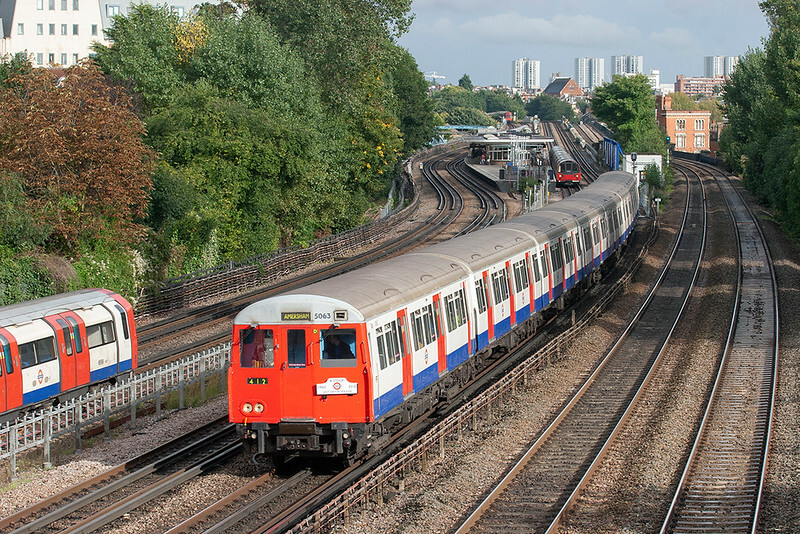 Very quickly the next oldest stock on the Underground, the C-Stock (used on the Hammersmith and City Line) and the D-Stock (on the District) will start to be replaced by the S7 stock currently being delivered. As with all things, now they have gone I wish I had taken more pictures of them over the years whilst I had the chance, so I suppose I had better get my finger out and get a few more of the ones pictured above. I hope my little tribute to final day of the A-Stock has been of interest. The rest of the days pictures can be viewed HERE, please look out in a few weeks for edition number 30, bye for now! Bienvenue. Accueillez en arrière à blog numéro 28 de Railwaymedia! As mentioned in the last edition, this one will be documenting my trip to France. I got back over a week ago now but for some reason processing the pictures seems to take as long as it does actually going and taking them in the first place. I'll try to cover here where we went and what locations we found, hopefully this will be of any interest to anyone wishing to follow in our footsteps. The reason for another trip abroad (I've been really pushing my luck this year with passes out the house!) was that I got some free tickets off Eurostar due to a delay last year. I had expected only two returns, hence the trip with the wife to Belgium the other month, but it turned out I was entitled to four, so a trip to Paris was agreed and was arranged with my friend Richard to utilise the other pair. We arrived just before the evening peak hour so headed out one stop on the local train from Gare du Nord to the busy suburban station of Saint-Dennis. This has about 8 platforms and is served by both line D of the RER and also services from Nord out towards Pontoise. 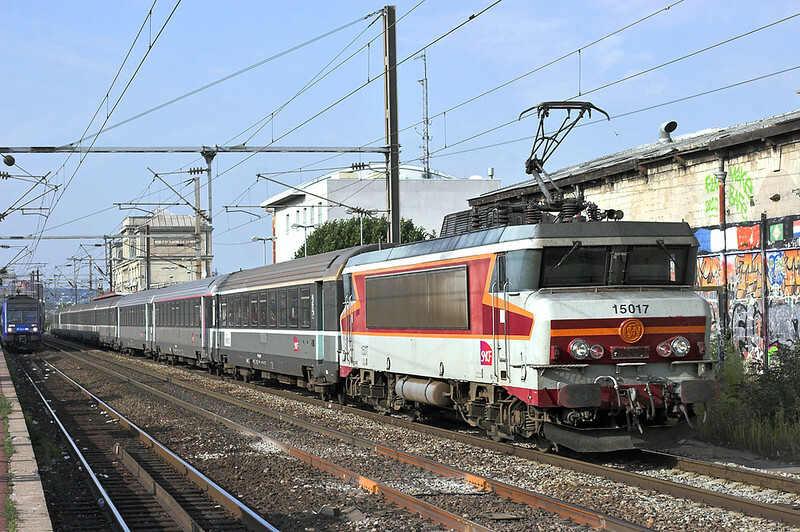 It is also located on the mainline towards Lille, Amiens and St Quentin, so the 'fast' lines have a procession of TGVs, Thalys and Loco Hauled expresses; pictured above is an BB15000 on an Inter City heading into Paris. There are a few local trains during the peak hour hauled (or pushed) by class BB17000 locos. There is no gaurantee which end the loco will be however which is somewhat inconvenient. 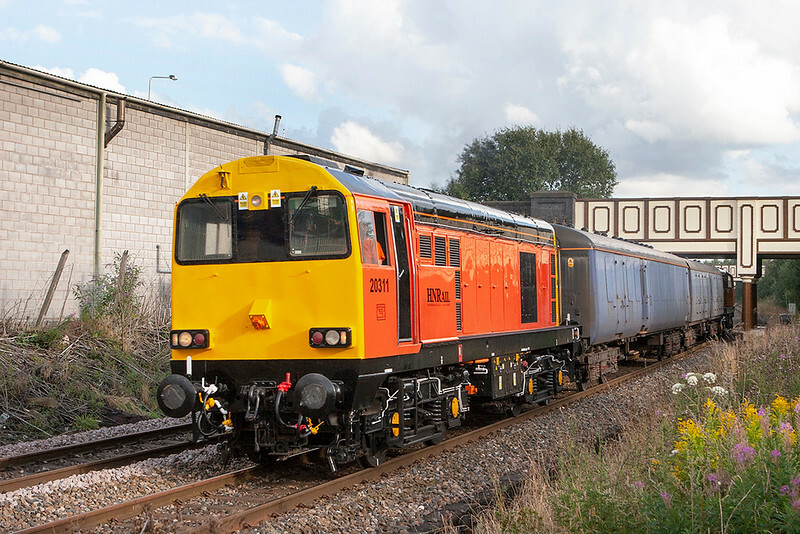 There has been a large influx of new units built by Bombardier which have replaced most of the stainless steel class Z6100 dating from the 1960s, and presumably these will eventually also replace the locos. 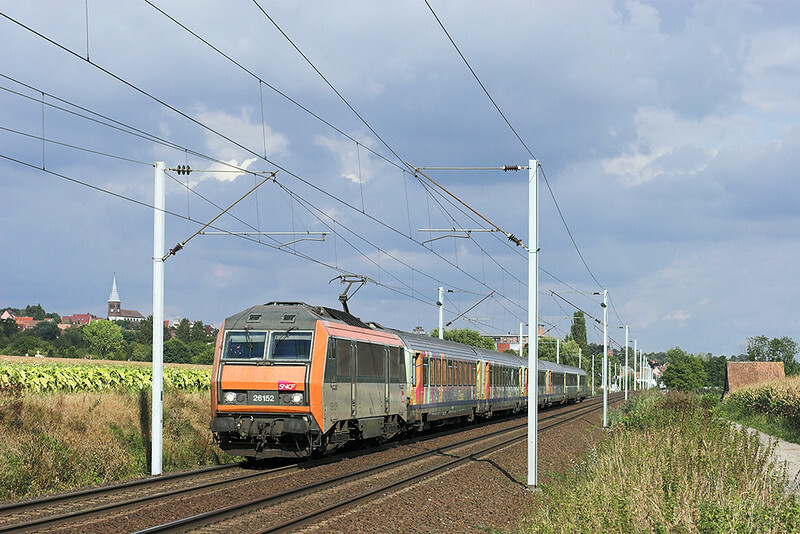 Also hanging on are the BB16000s on trains towards Amiens and Boulogne. These were meant to have been out of service last December but the latest word is that this December will see their end. The original plan had been to spend the week staying in Paris but a chance find by Richard of a good location near Strasbourg changed that. 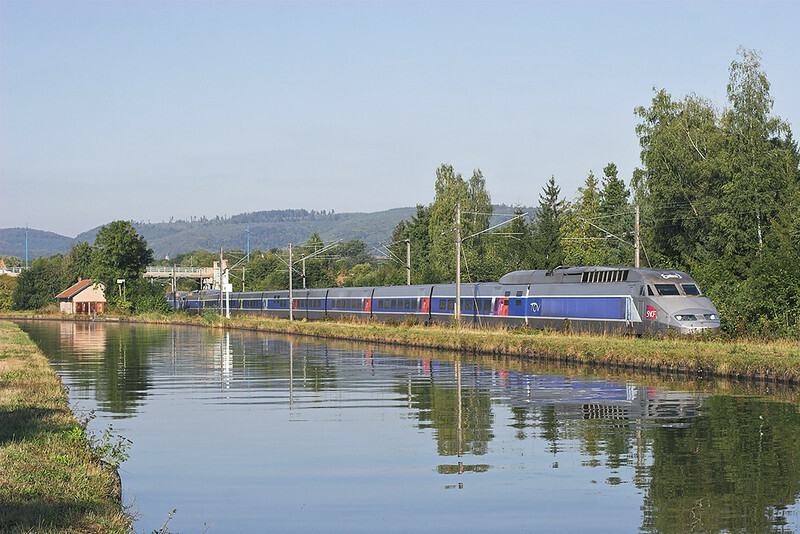 I must admit I didn't particularly fancy 4 nights in Paris, so instead on Tuesday we caught the TGV out east with Steinbourg in Alsace being our new destination. 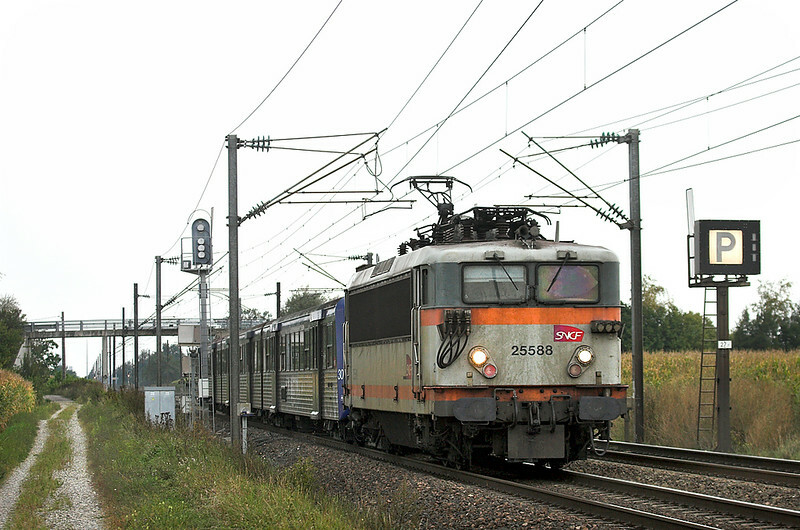 Strasbourg has quite a few diagrams for locos on peak hour trains with BB25500 electrics on services to Saverne and Sèlestat and the ubiquitous BB67400 diesels heading out towards Haguenau. Arriving mid- morning into Strasbourg we headed south down the mainline towards Sèlestat, where there is one midday diagram using a loco. Using a combination of both luck and google maps, we found a good location about 10 minutes walk south from Benfeld station, nearer the village of Huttenheim. 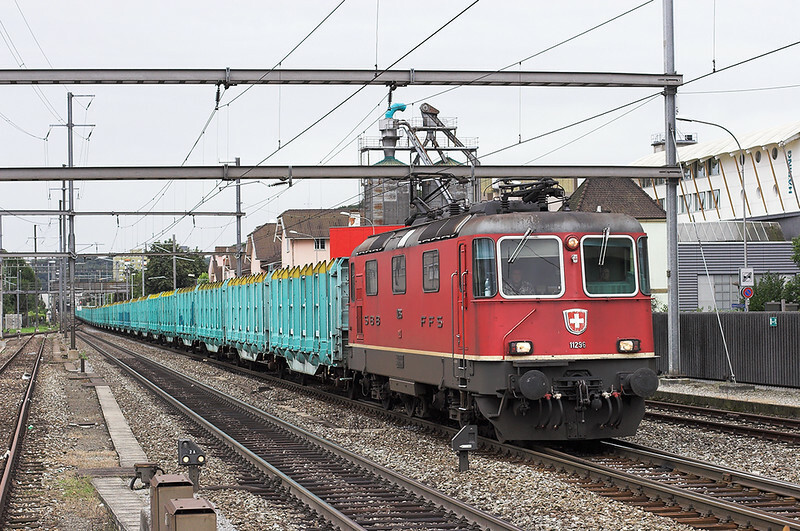 On this line there is a good mix of freight, TGVs and also the hourly Alsace Express trains running between Strasbourg and Basel. 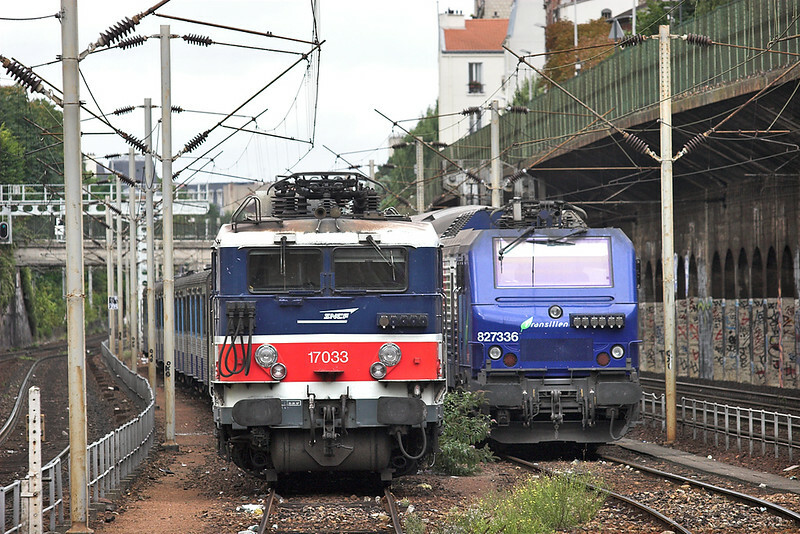 These are push-pull operated with the Sybic class BB26000 engines, though in common with all Strasbourg trains the loco is at the north end. 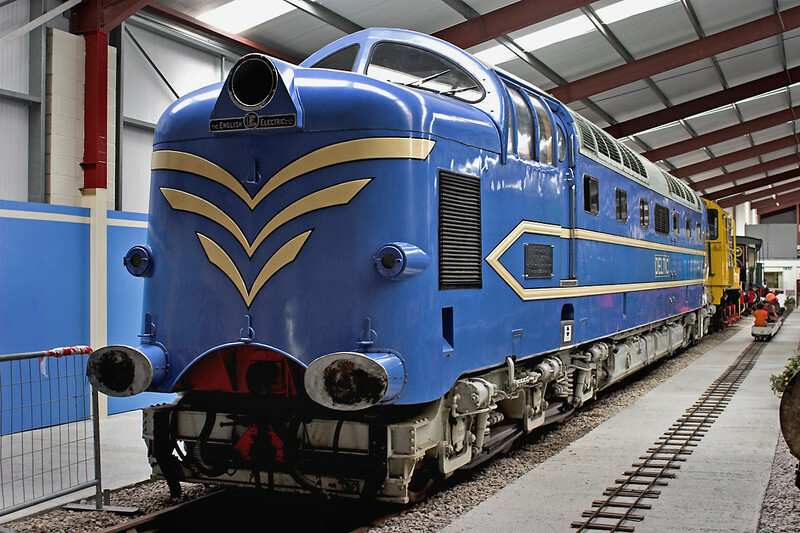 There are though a few International trains, such as pictured, which run with normal coaches so have the engine on the front. The light here is good until about 10am (in summer) for northbound trains, then for southbound trains until mid-afternoon. 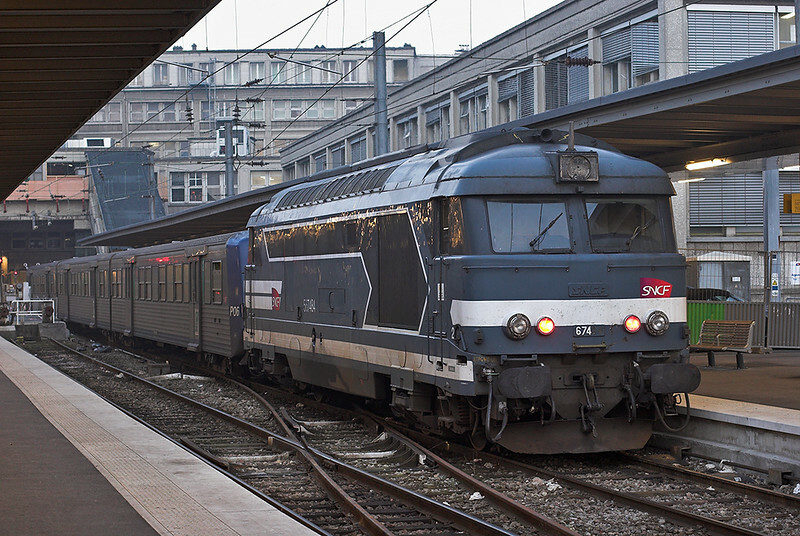 We caught the train at 1439 back to Strasbourg in order to reach Steinbourg for the evening peak when there are 4 hauled local trains scheduled on top of several Sybic hauled Metz and Nancy workings. Unfortunately the slight brightness we had got earlier at Huttenheim didn't last and we spent some of the afternoon huddled under a bridge sheltering from a thunderstorm! At Steinbourg the railway runs for a short distance alongside the Marne-Rhine Canal, and it was the prospect of this location, and the light being right during the afternoon that had lead us to staying in the Hotel Arial about 20 minutes walk along the canal towards Saverne. The paucity of French railway timetables (the last train from Strasbourg is at 2025) did mean we were stuck in the hotel during the evening, but the hotel did an excellent 3 course set meal for €17. Our second day in Alsace continued the dull weather theme of the previous afternoon, though without the rain, and therefore we changed plans and during the morning went for a ride on the express to Basel. It is less than 90 minutes from Strasbourg so we spent two hours at the very busy station of Pratteln two stops from Basel towards Olten. I had visited this station on a previous trip to Switzerland and it didn't disappoint in terms of sheer volume of traffic. In the first 20 minutes after we arrived we got to see no less than 8 freight trains in addition to passenger trains! Pratteln is at the eastern end of the main freight yards of Basel and is where traffic towards Zürich and Olten divides, therefore the main problem usually is deciding which platform to stand on to get the most pictures. This was less of a problem as the light was so terrible. We then made the journey back to France, after a visit to the excellent off-licence on Basel station for a couple of bottles of Swiss beer, with the intention of covering the afternoon rush-hour on the diesel line from Strasbourg to Haguenau. Again the engines are always on the north end, the line is also not very photogenic. The light is about right for evening trains between Bischwiller and Haguenau, but there did not appear to be too many locations, certainly not within walking distance of a station. I made my way back two stops to Bischwiller where there is a reasonable shot off the end of one platform. There are also level crossings at both ends of the town which give a bit more scope. It did threaten to brighten up briefly, although this didn't of course coincide with any trains appearing. After a bit of a disappointing afternoon we headed back to the hotel and checked the weather forecast for the next day, which promised to be only moderately better. Fortunatley though it did turn out nicer than expected. Richard went to try to visit the railway museum at Mulhouse, Cite Du Train, an expedition which wasn't entirely successful due to it being quite a tram ride away from the station. Instead I returned to Benfeld and Huttenheim, and was blessed with a morning of mainly sunny weather. I went a little further up the farm track to get some different angles from what I had taken two days previously. I had considered heading north from Benfeld station but at that point the line is 3 tracks wide so wouldn't be quite as good a location. There was a steady procession of freight trains and passenger workings; I think one of the Sybics had failed earlier causing a backlog. 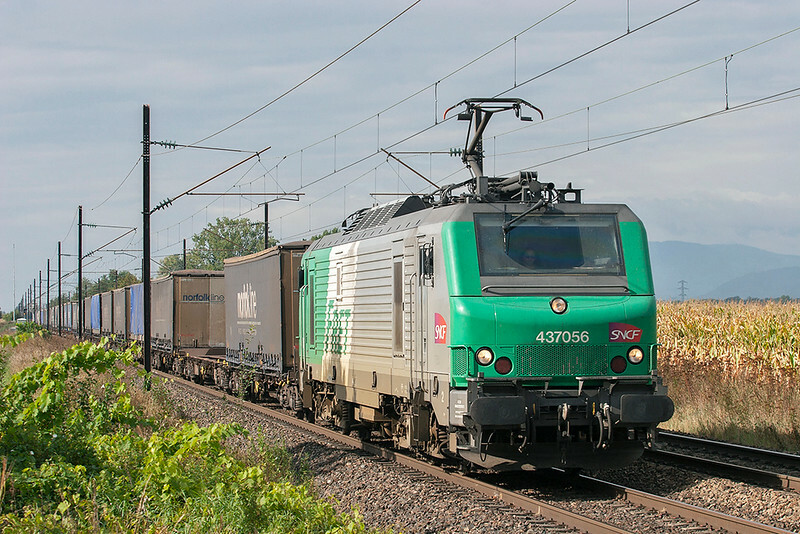 With good light on what must be one of the best routes in France for freight, albeit mainly hauled by the class BB37000s (seen above) I ended up spending all morning here. We had considered another location on this route, just north of Fegersheim Lipsheim, for pictures of afternoon BB25500 trains but being our last day in the area we made our way to the other side of Strasbourg and the line to Saverne. This is an excellent line for photography, with farm tracks alongside good portions of the route. Besides the canal bank at Steinbourg, other places we spotted from the train that looked very promising were east of Schwindratzheim, west of Hochfelden and most of the lineside between Dettwiller and Wilwisheim. Google Maps will help you locate these, it should be noted though that between Wilwisheim and Dettwiller a massive new bridge is being constructed for the extension of the LGV (Ligne a Grande Vitesse) Est. 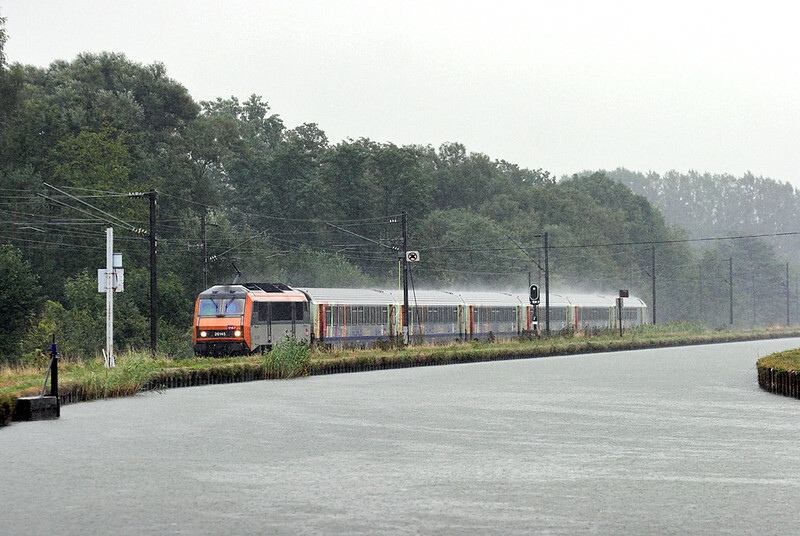 Once this is completed all the TGV services currently using the 'classic' line through Saverne will be diverted away. We would have liked to have got some shots with this construction in the background but there simply wasn't enough time. In the end, Richard went to Schwindratzheim for a few hours whilst and I tried the spot west of Hochfelden. 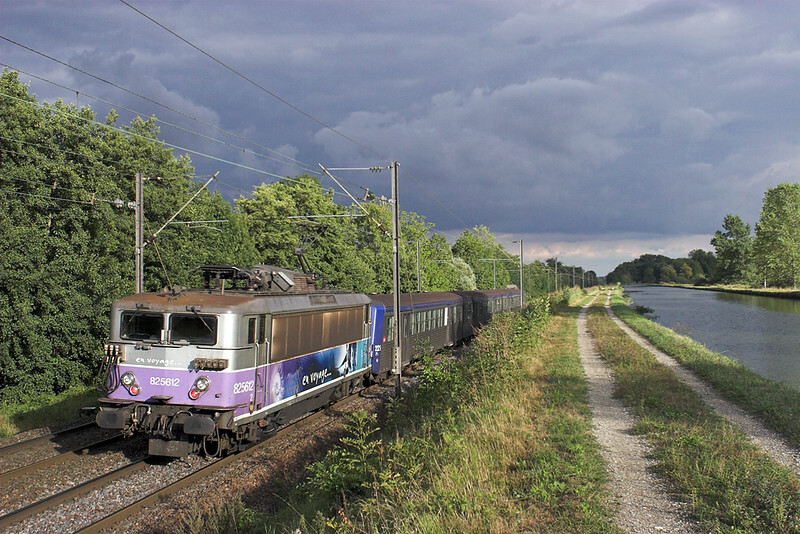 It was hit and miss with the sun, the shot above of the 1620 Strasbourg to Nancy train was the only one at that location in perfect light; the Euro Cargo Rail class 77 that was five minutes behind it just preceeded a break in the cloud by about 30 seconds. Walking back to the station however I fell lucky. Warned by the operation of the several level crossings in the town, another class 77 emerged slowly from the loop beyond the station into the smallest patch of sun possible. It's not often I am that lucky! PDF Timetables for this route can be found on the local SNCF Website, use the drop down box under 'Liste des fiches horaires' to find the Strasbourg-Saverne-Sarrebourg timetable. The first of the Loco-Hauled locals came past in the worst possible lighting conditions, namely full dull with the sun out on the last coach, so I decided to risk going to Steinbourg on the next one in the hope of some sun for the classic canal shot, which after all was really the only reason we had chosen to stay in the hotel there. It wasn't looking too promising but a thin break in the clouds lingered. It caused me to do much jogging up and down the tow path in order to follow the sun, but I finally managed to get a few shots in the late evening light. 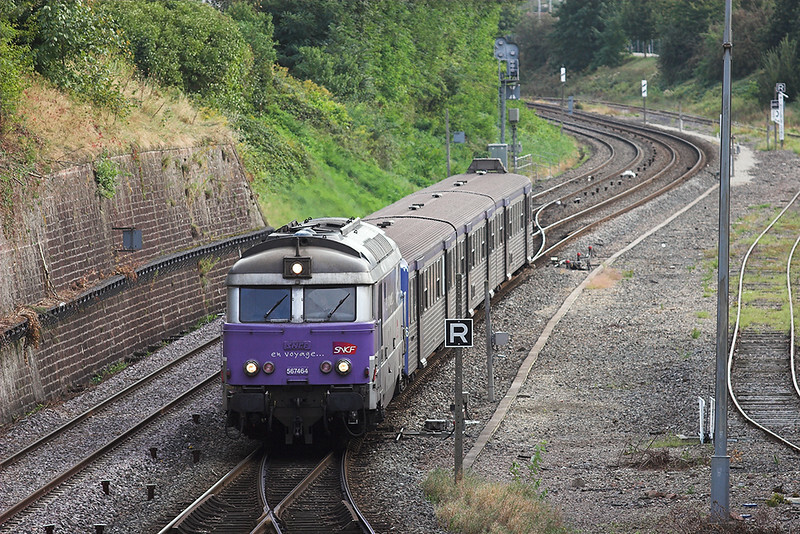 The BB25500 hauled trains are the 1625, 1655, 1725 and 1825 trains from Strasbourg, along with the 1753 and 1853 returns from Saverne. 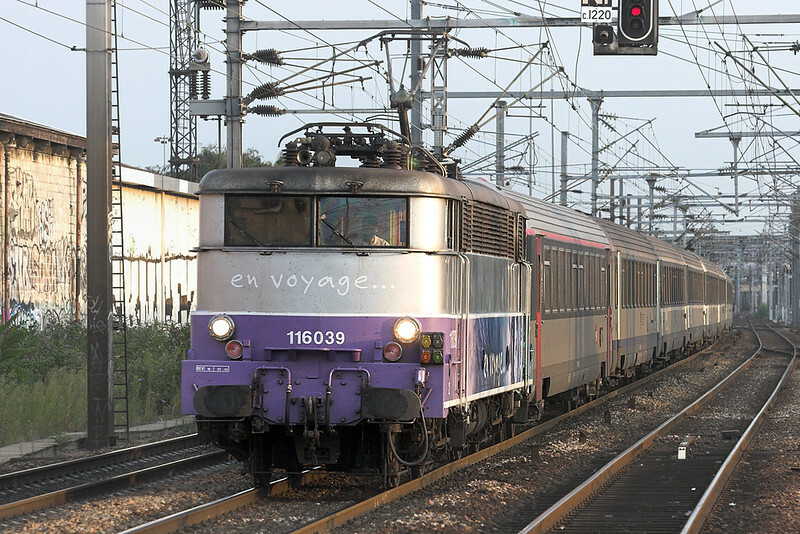 In summer time it would also be possible to get a shot of the much later 2025 departure, though with SNCF having ordered many new units for delivery how long these loco's will survive is anyones guess. Friday was our day to return with us booked on the 1046 TGV back to Paris. The day dawned beautiful and so we made the decision not to catch the 0828 train from Steinbourg but to risk getting the 0958 with just a 10 minute connection at Strasbourg for our TGV. The local trains seem to run very promptly on this line so the decision was the right one, although it did preclude us having time to look at the City of Strasbourg itself, which I understand is a World Heritage Site. There seems to be a dearth of loco hauled trains in a morning along here with all the trains going by, even the ones from Metz and Nancy, being formed of the small batch of 2 car electric units based in the area. We just missed a freight train as we walked along the canal, but did manage a few shots of TGVs from the opposite canal bank. Of course once the LGV Est is open these will no longer pass Steinbourg so it is worth going for some pictures of them soon. 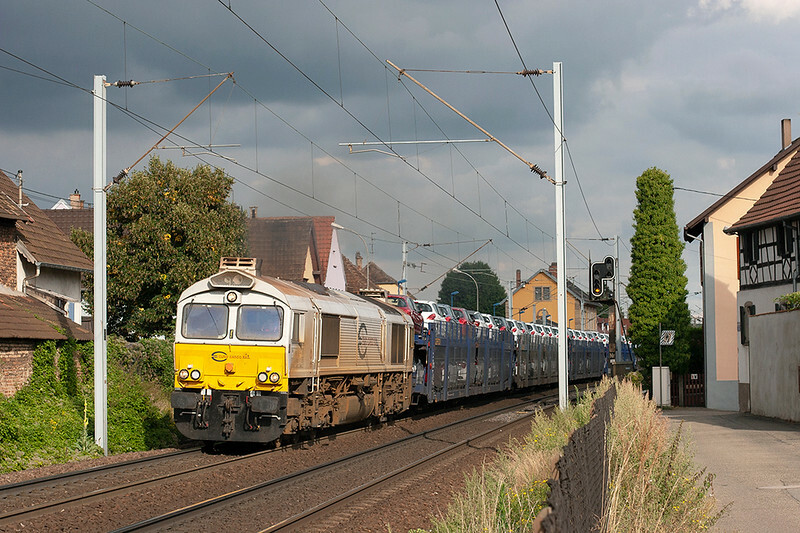 So it was on to Paris for a couple of hours to try to get some shots of the BB17000s that work out of Paris St Lazare. I was quite astounded to see the frequency of these trains with, even off-peak, 8 departures an hour on the line through Argenteuil to Ermont Eaubonne, Mantes La Jolie and Pontoise. Unfortunately the busy section to Argenteuil isn't exactly the most picturesque line in the world, to put it mildly, but one advantage is that unlike those working out of Gare du Nord all trains are formed with the loco on the same, Paris, end. 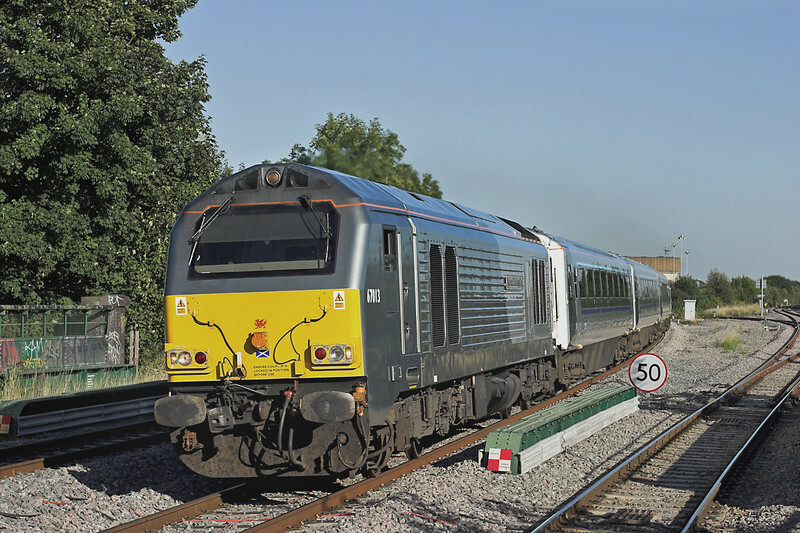 It is about a 40/60 split between the BB17000s and the newer BB27300s. With the weather in Paris being back to the expected thick clouds, getting any photographs in the equally dull Parisian suburbs was a challenge and I didn't get much luck getting shots of the older engines. 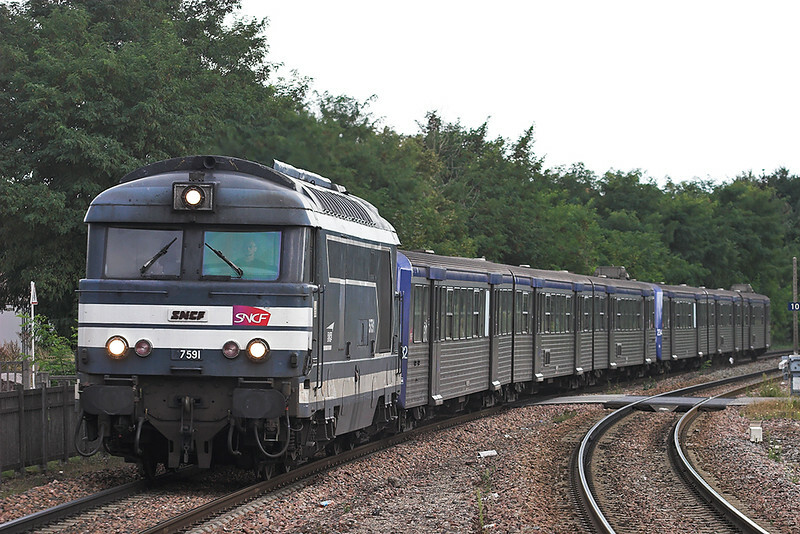 About the best station we found was Sannois on the branch to Ermont Eaubonne; Richard did get a shot of a 17000 there but I missed it as I had gone to Bois Colombes to photograph the two rakes stabled there. And that was about it for France. Although I'd gone with the intention of the trip pretty much wrapping up my interest in the trains of the country, I have to say that if anything it has got me more interested; certainly more investigation of the lines out of St Lazare is needed. I hope some of all this will be useful to anyone planning a visit to the Alsace region, a few days on the main line either side of Strasbourg is certainly recommended. 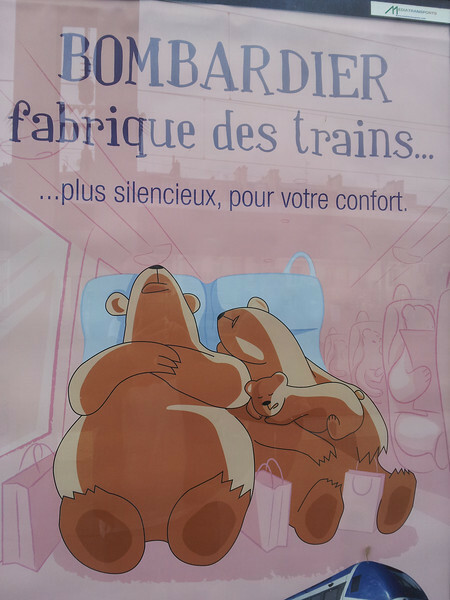 Thanks for reading: I shall leave you with a picture of a poster I spotted on a Paris station. The Bombadier built new units are clean and quiet, though not exactly comfortable. I certainly can't imagine such advertising being carried out at any of our British stations served by the Bombardier built Voyagers though! Bye for now.